Socrates (Greek: ??????? ?, so?kra?t? ?s, S?kr�t?s; c. 469 BC�399 BC, in English pronounced /?s?kr?ti?z/) was a Classical Greek Athenian philosopher. Credited as one of the founders of Western philosophy, he is an enigmatic figure known chiefly through the accounts of later classical writers, especially the writings of his students Plato and Xenophon, and the plays of his contemporary Aristophanes. Many would claim that Plato's dialogues are the most comprehensive accounts of Socrates to survive from antiquity. 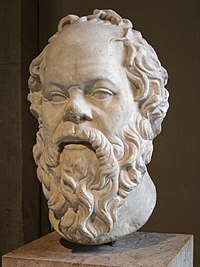 Through his portrayal in Plato's dialogues, Socrates has become renowned for his contribution to the field of ethics, and it is this Platonic Socrates who also lends his name to the concepts of Socratic irony and the Socratic method, or elenchus. The latter remains a commonly used tool in a wide range of discussions, and is a type of pedagogy in which a series of questions are asked not only to draw individual answers, but also to encourage fundamental insight into the issue at hand. It is Plato's Socrates that also made important and lasting contributions to the fields of epistemology and logic, and the influence of his ideas and approach remains strong in providing a foundation for much western philosophy that followed. As one recent commentator has put it, Plato, the idealist, offers "an idol, a master figure, for philosophy. A Saint, a prophet of the 'Sun-God', a teacher condemned for his teachings as a heretic." Yet, the 'real' Socrates, like many of the other Ancient philosophers, remains at best enigmatic and at worst unknown. Source: http://en.wikipedia.org/wiki/Socrates retrieved on 2010-10-07 22:17:04.